Returning back to Bangkok, after about 20 years, we noticed some things have changed, mostly for the better. Having traveled here solely for business about 20 years ago, we returned to explore the city as a tourist, and Bangkok is a good destination from which to go to Cambodia, Vietnam and Laos. 1. 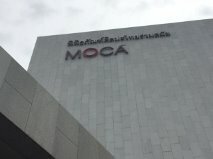 MOCA (Museum of Contemporary Art- MOCA) has a collection of modern art in a cool building. Although an hour Uber ride from our hotel, the building was gorgeous and housed some fascinating pieces of art. Definitely one of the highlights during this visit. 2. 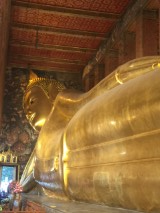 Wat Pho is royal temple dating back to about 1650 time period housing a huge reclining Buddha. 3. Museum Siam is an interactive museum on the history and culture of Thailand. Not the best museum but a great way to pick up some addition history on Thailand. Great for kids. From 4-6 pm, the museum offers free admission to all. 4. Lumphini Park is a gorgeous park in central Bangkok. We visited on a Saturday night around 6 pm, and there were a plethora of runners and folks out enjoying the park. While we were in the park, all of sudden, as the Thai national anthem started playing, everyone in the park stopped moving (everyone), and the feral dogs started howling. Uber is in Bangkok. We used Uber a few times, but compared with the traditional taxi services, Uber was not great, just yet. Drivers seem much less experienced and there are not many (although there is likely a small population looking for them). In a city challenged with traffic, driving skills are key and our taxi drivers clearly out maneuvered their Uber counterparts. The subway system (MRT and BTS and 10-20 years old respectively) is clean and efficient. Great way to get around the city and avoid traffic. We were also impressed by the organized queuing system that the Thais seem to obey to get on and off the MRT. We also need to give a shout out to Riva Surya hotel (Riva Surya ). It was off the beaten path on the Chao Praya river with rooms overlooking the water. The restaurant and pool also overlook the river. Overall, the hotel is a nice respite from the rest of the Bangkok scene, especially places like Sukhumvit Road with a lot of the shopping and standard American hotels. In addition, the hotel is in close proximity to the Grand Palace, Wat Pho, Temple of Dawn and many other destination points. .and do much better than any of the morons that are in office or running now. at your back……. the next segment …. Have the rains stopped……..
Its the 5th over here. we are 11 hours ahead of you. sun is out for now but it has been wet.